The Joint Commission starting next year will cite hospitals if they fail to use specific naming conventions to identify newborns. The new requirement, which will begin Jan. 1, is intended to mitigate the possibility of misidentifying newborns, which can lead to serious medical errors. Misidentification of newborns can result in babies getting the wrong breast milk or blood. Lab readings for the wrong patient and even surgery performed on the wrong infant can occur as well. Data available on the nationwide incidence of newborn misidentification in hospitals is sparse but a 2016 study from the Pennsylvania Patient Safety Authority found nearly two newborn misidentification events occur every day in the state. Research shows that one way hospitals can reduce newborn misidentification is to use more distinct naming conventions upon birth. But a 2015 survey from the American Academy of Pediatrics found that 81.7% of the 339 neonatal intensive-care units that responded used nondistinct naming conventions like “BabyBoy” that don’t use the mother’s last name. The Joint Commission will require hospitals with labor and delivery services to use at least two distinct naming conventions for newborns. The accreditor offers three methods to identify newborns, but it’s up to hospitals to decide which they’ll use, said Dr. Andrew Bland, medical director of the division of healthcare quality evaluation at the Joint Commission. One naming convention the Joint Commission offers is putting the mother’s first and last name along with the newborn’s gender on a wrist band. Another is for a hospital to have a standard practice like using two bands per patients or a barcoding technology. The new requirement shouldn’t come as a surprise to hospitals. The Joint Commission issued a report in October 2015 that explained the risk of newborn misidentification and ways hospitals can address it, Bland said. “There has been a progressive change management approach,” he added. 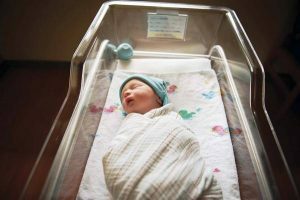 The new requirement, called an element of performance, allows surveyors to issue a requirement for improvement if he or she finds during on-site inspections a hospital fails to use at least two patient identifier methods for newborns. A requirement for improvement by the Joint Commission requires a hospital to submit a plan detailing how they will resolve the issue. The commission follows up with the organization to ensure the correction plan has been implemented. The Joint Commission typically conducts on-site hospital surveys every three years for accreditation renewal. Enter your email address to subscribe and receive notifications of events and current news happening in West Virginia.